The free expression of ideas (i.e., free speech) is much broader than the First Amendment of the U.S. Constitution. The concept of free expression is not unique to the U.S., did not originate with our Constitution, and is not limited in scope by anything one finds in our Constitution. 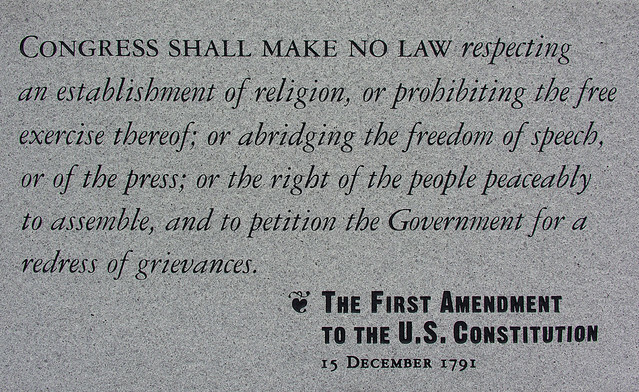 The First Amendment is valuable, and it addresses some of what is important about free expression. And yet, there are many issues related to free expression to which it does not apply. And so, it is important to recognize that not every important aspect of free expression is addressed by our Constitution. Something can be germane to the free expression of ideas without being a First Amendment issue. I mention this because I repeatedly see persons who favor increased restrictions on free expression by private companies (e.g., Facebook, Twitter, Youtube) claiming that non-governmental entities cannot censor content or suppress the free expression of ideas. Such claims take an overly narrow approach to free expression. Not all issues of free expression are First Amendment issues. It is true that the First Amendment does not prevent a private company like Twitter banning users, deleting "offensive" tweets (or those some think are threats); however, this does not mean that these actions are somehow irrelevant to the free expression of ideas or that we should embrace them. As someone who values freethought and the free expression of ideas, I want more ideas rather than less. I want to be able to access the ideas I'd like to access, and I want everyone else to be able to do the same. That means that I want content delivery platforms to provide everyone with the same opportunities to deliver, promote, and profit from their content. I recognize that a private company can decide not to do this without running afoul of the First Amendment, but this does not make their decision to do so any more acceptable. None of this means that I want myself or anyone else to be forcibly subjected to content we don't like. Even at the broadest level, free expression does not mean that I get to inflict my ideas on others against their will. It also does not mean that content delivery platforms shouldn't offer their users a way to tailor their experience to maximize exposure to content they want and minimize exposure to content they don't want. What it means is that such choices should reside with us instead of being made for us.